In most cases, different areas of your home will be warmer or cooler than other areas. Individual rooms are impact by a variety of factors like inflation, sunlight and more. If you only have one thermostat, this can be a problem, since the thermostat will only read the temperature in one specific room. This ends up wasting energy and significantly reducing the energy efficiency of your home overall. This is why many homeowners are starting to turn to zoned heating and cooling for their home needs. Here are the zoned heating and cooling system basics for homeowners. The zoned heating and cooling system work pretty simply. Instead of inefficiently using only one thermostat, it takes advantage of multiple thermostats placed strategically throughout the home. This allows your HVAC system to monitor the temperature in various rooms of the house for more accurate energy use to best meet heating and cooling needs. These separate thermostats are wired to a central control panel. This panel operates the dampers in the ductwork of your system. This ensures that dampers only open or close in areas that need warm or cool air. This system will help you prevent inconsistent room temperatures from room to room. It also allows you to cool or heat one room specifically to a desired temperature. You will have much more control with a zoned HVAC system. If your system is set up and installed properly, it can save you tons of money on energy bills while also helping to protect the environment and reduce your home's carbon footprint. The U.S. Department of Energy claims that homeowner who uses zoned heating and cooling systems look to save about 30% on their annual energy costs. This also allows you to stop using energy in rooms that aren't use frequently such as a guest bedroom. You can avoid having to heat or cool the entire house if it is unnecessary. You can choose from various "zone" numbers depending on how large your home is and where you would like to place the thermostats. You may have just two, one for upstairs and the other for downstairs. In other homes however you may have multiple thermostats on each floor. Speak with a professional about the best installation options for your home. While the savings are significant, some homeowners are reluctant to install a zone system. This is because the initial investment can be costly upfront. However, savings over time will offset this cost, giving you a significant return on your investment. However, a complete system overhaul is not possible for everyone due to financial situations. If a full system isn't in your budget, you can also look into retrofitted options that install into your pre-existing ductwork with the same or similar energy efficiency benefits. If you are interested in zoned heating and cooling, be sure to discuss options and pricing with a professional to find the best options for you and your home's energy needs. These zoned systems help to monitor the temperature in various rooms to provide the best heating and cooling options as needed to keep your entire home conformable. 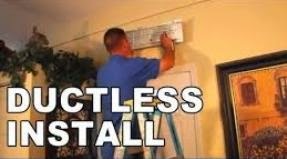 Whether you choose a traditional duct damper system or you choose a ductless air conditionings ystem, zoning is definitely a smart option for all homeowners.